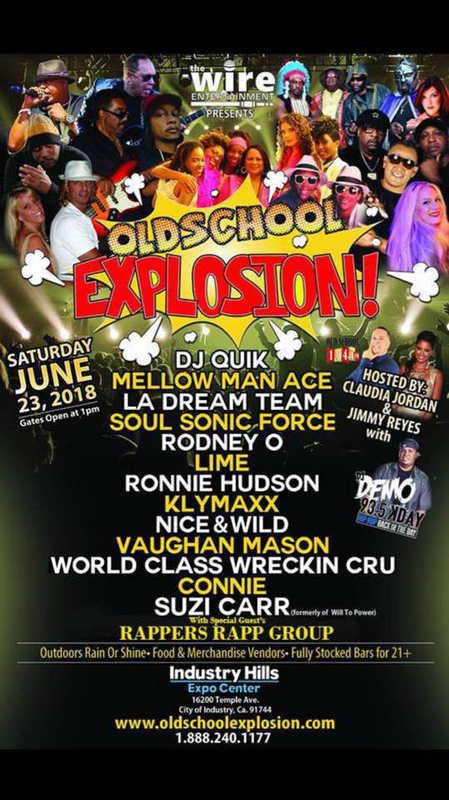 Old Skool Explosion Saturday June, 23 2018. The Wire Entertainment presents Old Skool Explosion. Featuring DJ Quik, Mellow Man Ace, LA Dream Team, Soul Sonic Force, Rodney O, Connie, Lime Ronnie Hudson, Klymaxx, Nice & Wild, Vaughan Mason, Suzi Carr (formerly of Will to Power) World Class Wreckin Cru with special guests Rappers Rapp Group. Outdoors, Rain or Shine. Food and merchandise vendors. Fully stocked bar for 21 and over. Hosted by: Claudia Jordan and Jimmy Reyes with DJ Demo, 93.5 KDay. Industry Hills Expo Center – 16200 Temple Avenue. City of Industry, California 91744. 1-888-240-1177. Gates open at 1:00 pm. The South Florida native, who aspired to perform since childhood, Connie realized her dreams after a friend introduced her to the legendary music producer, Henry Stone. Stone, best known as the co-owner and president of TK Records with a career spanning R&B in the early 1950s through the disco boom of the 1970s to the present day, would go on to become the executive producer of Connie’s debut single “Funky Little Beat”, catapulting the young singer onto the international music scene. In 1986, while under the Sunnyview Record label, Connie released her second single “Experience“, which along with “Funky Little Beat“, “Your Eyes”, “I Can’t Stop”, “Fire In My Heart”, “Laughter In The Rain”, “I’m In Love With You”, and “Rock Me”, provided her self-title debut album CONNIE.